The Club de Artesanas (CdA) held the Fiesta de Don Jorge on January 12th to liven up the month. Most CdA members had fled to the city or rural communities for this last month of the school vacation, so the few members in town brought all their kids or siblings. Eight year old Zuni and 10 year old Veronica made a lime cake and a chocolate cake so that the end result would be a 4 layer cake of alternating flavors. While the cake baked they moved into the biblioteca (library) to join the other kids in making masks, crowns, and sombreros locos for the “Grand March”. The teen chicos who have participated for 4 years weren´t sure if it was cool but couldn´t resist the lure of Pique Macho for lunch and in no time they´d joined into the spirit of the party. work. 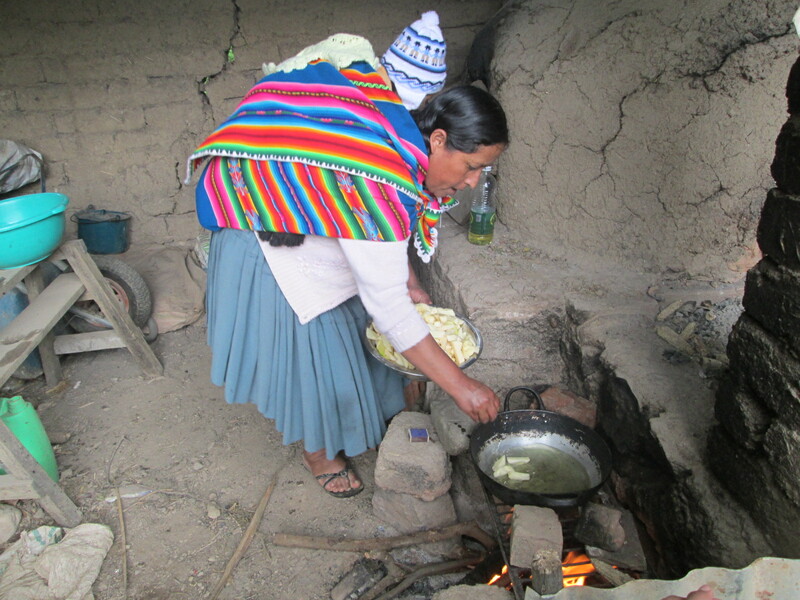 Doña Máxima insisted that the best way to cook the fries was outside on the firewood grill. They were heavenly crisp on the outside and soft on the inside. The kids loved garnishing their own plates from the assortment of condiments. Games were played between lunch and cake, and although they´re always the same the enjoyment never seems to lessen. There were prizes of school supplies and toothbrushes for all. The great thing about the party is that half of the party and fun is in the joint preparation which makes hosting easy. 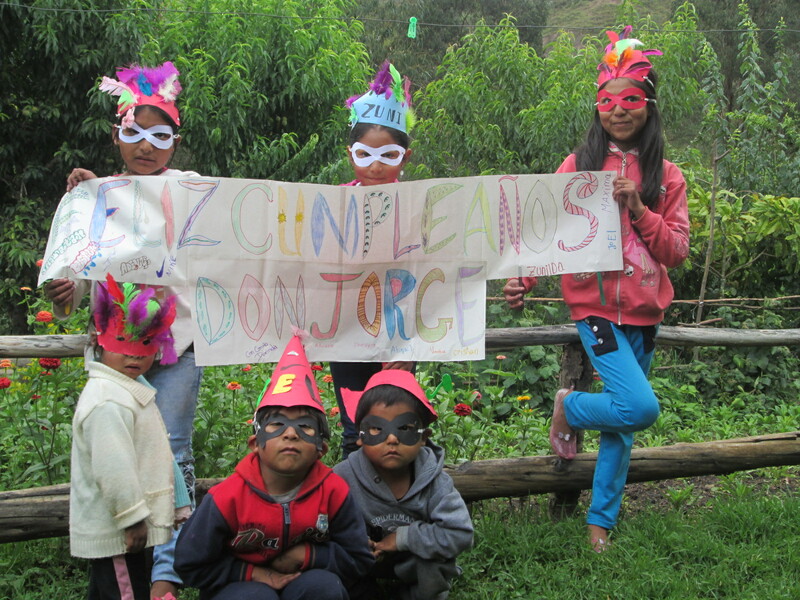 Don Jorge is Dorinda´s dad, and he receives photos and birthday wishes in time for his February birthday. The weavers are working on 2 orders which has never happened before. 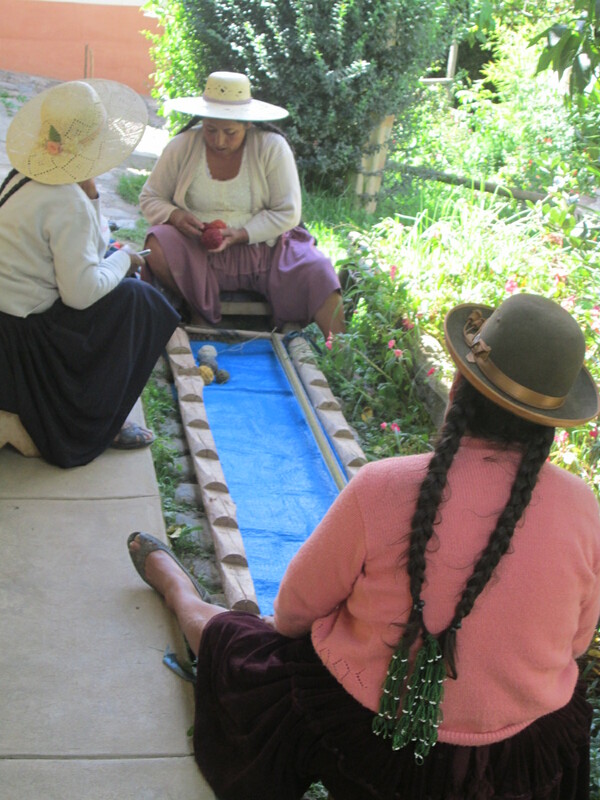 Laverne Waddington who has been a strong supporter of PAZA since meeting Dorinda and Doña Maxima at the 2010 Tinkuy had placed her annual order for the fajas that she uses in her weaving workshops. Her specifications are exacting and her orders have proven to be a great teaching and learning tool for helping the weavers weave to specifications, which is a requirement for selling to a foreign market. Unfortunately there is no national market for the traditional textiles. starts. Hopefully, she will encourage her peers to learn to weave. 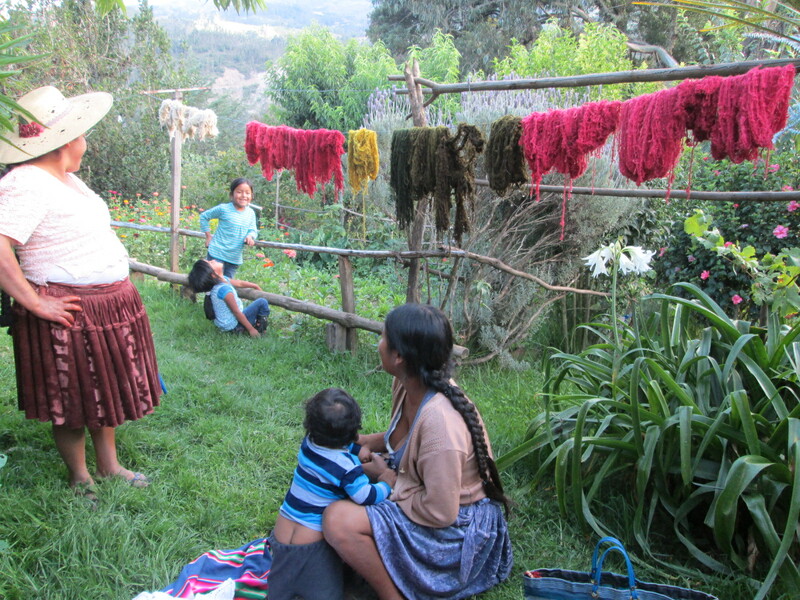 It´s a wonderful thing to see the weavers so lively and animated when they stop by the PAZA workshop on Sundays to drop off their orders, pick up payments and discover there is another order. This is the time of year mothers are in panic mode trying to figure out where the cash will come from to pay for school supplies and uniforms. Two CdA days were spent dyeing skeins because of the request for cochineal red. A few weavers had left skeins to be dyed and others asked to buy dyed skeins from PAZA. Citric acid was used with the cochineal on the first dye day so that orange tones were achieved. Suyku leaves were ready for harvest and gathered for the first time in almost a year to produce green dye baths during the 2nd dye day. The mordant for the cochineal pot was alum with cream of tartar as an assistant to produce pinks. 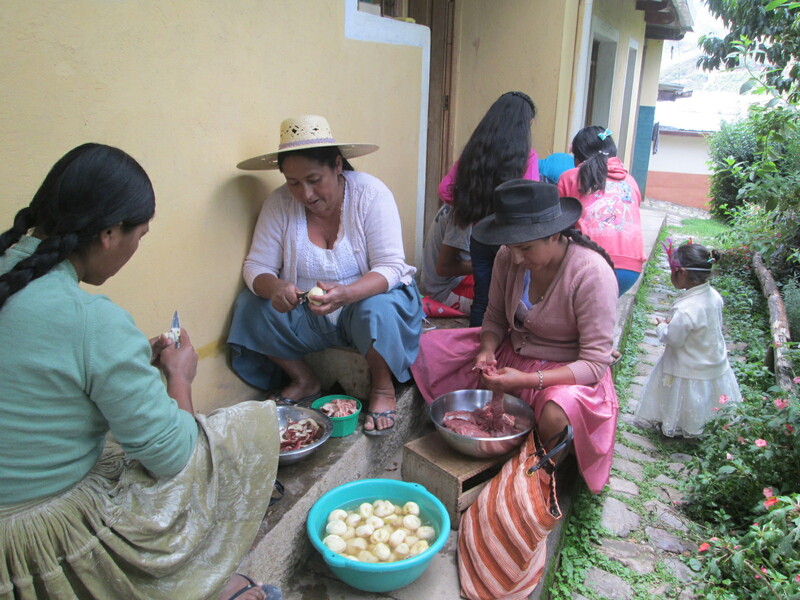 All that was added to the final dye bath was vinegar from chicha (fermented corn beverage) that had turned. 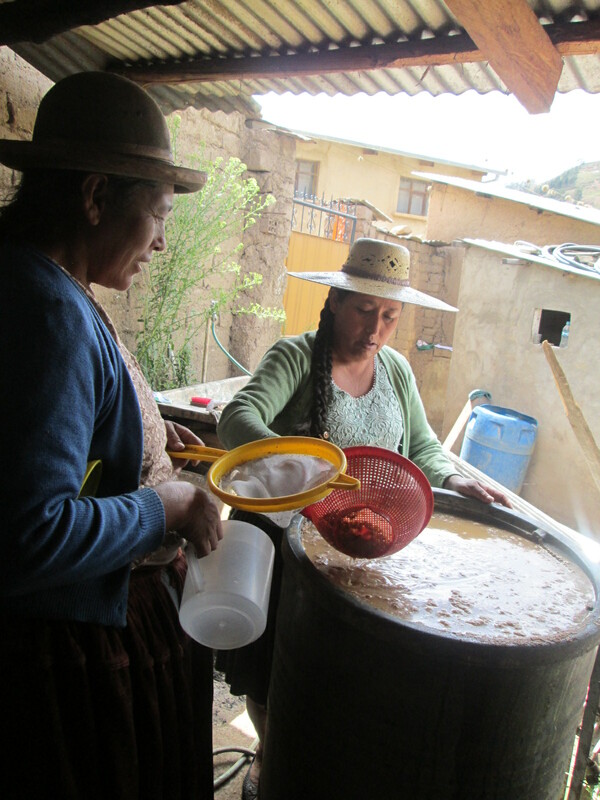 Doña Antonia had a 55 gallon barrel of bubbling vinegar leftover from her daughter´s graduation party.